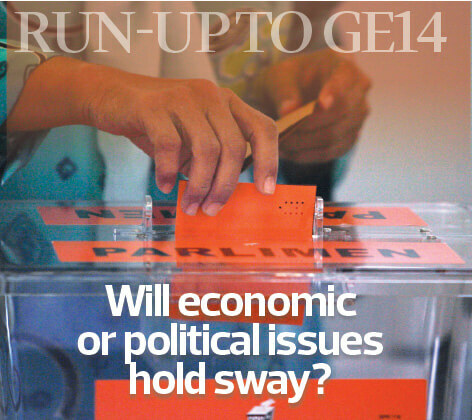 Run-Up to GE14: Will economic or political issues hold sway? The outcome of a general election in Malaysia may not be that hard to predict, given that the Umno-led coalition has won every one since independence in 1957. The Barisan Nasional (BN), along with its predecessor — the Alliance Party — is today the longest ruling party in the democratic world. Will the 14th general election, which must be held anytime between now and August 2018, be any different? Worldwide trends at present indicate that populism holds sway, and that race and religious issues have become important factors in influencing election results. At the same time, bread-and-butter matters such as employment still dominate many campaigns, while fickle-minded voters, especially the youth, are less easy to figure out. In the last couple of years, pollsters and major news channels have more often than not got their predictions wrong. David Cameron had called for a referendum on whether Britain should remain in the European Union as he believed the British people would be all for it. What he got instead was a vote in favour of Britain exiting the EU, or Brexit. Just a year later, his successor, Theresa May, called a snap election, confident that she would strengthen her position and that of the Conservative Party. It turned out to be a setback for the Tories, who lost their parliamentary majority as a resurgent Labour Party surprisingly won over the bulk of young voters. In between the British election and the Brexit referendum, Donald Trump in the US surprised everyone, including his own Republican Party, when he defeated Hillary Clinton in the presidential election with his populist “America First” campaign. Voters in France, meanwhile, handed Emmanuel Macron a landslide victory and checked the rise of Marine Le Pen’s far-right party — which came as a huge relief for the liberals of the world. Will Malaysia’s 14th general election spring any surprises? Can the opposition gain more votes and seats with such issues as rising unemployment and cost of living and more expensive healthcare as well as cuts in the education allocation? Will the irregularities at 1Malaysia Development Bhd (1MDB), FELDA and its unit, Felda Global Ventures Holdings Bhd (FGV), be enough to convince voters in the Malay heartlands and FELDA settlements to opt for a change? Or will Malaysians stick to the tried and tested BN that touts political stability and policies that have delivered continuous economic growth, albeit at a slower rate than before, for the larger part of its 60-year rule? Political strategist James Carville was credited with coming out with the phrase, “It’s the economy, stupid”, when he advised Bill Clinton to focus on economic issues during the US presidential election in 1992. Clinton defeated the senior George Bush, whom many had expected to win after the US had successfully defeated Iraq in the first Gulf War only a year earlier. To the ruling BN coalition’s credit, Malaysia has chalked up continued economic expansion in spite of a slew of external factors that have shaken economies globally over the past few of years. The Malaysian economy has managed to weather the volatility in commodity prices, in particular, crude oil prices, expectation of US interest rate hikes and an economic slowdown in China, among others. Malaysia has a good record in managing severe financial and economic downturns such as the Asian financial crisis of 1997-98 and the global recession of 2008. Second Finance Minister Datuk Seri Johari Abdul Ghani highlights this point when asked how the economy has fared since 2013. “From 2013 to 2016, the economy continued to record positive growth rates of 4.7%, 6%, 5% and 4.2% respectively. For 2017, we expect GDP growth to be better, at 4% to 5%. We also managed to diversify our economy with the services sector forming 54% of our economy; 23% in manufacturing; 9% in the mining sector, including oil and gas; 8% in agriculture; and 4.5% in the construction industry. “In terms of government revenue, in 2013, oil-related revenue was about 41% of total government revenue, but in 2016, it was only 14%,” he says in an exclusive interview with The Edge (see Page S4). In past elections, economic issues have influenced how Malaysian vote, save for the 1999 election when a high number of Malays voted against Umno because of its treatment of former deputy prime minister Datuk Seri Anwar Ibrahim. However, Chinese voters opted for stability, ensuring that BN continued its rule. In the run-up to the 11th general election in March 2004, the Malaysian economy was thriving, as evident from the 6.8% gross domestic product growth year on year in the fourth quarter, and robust growth in the previous quarters. 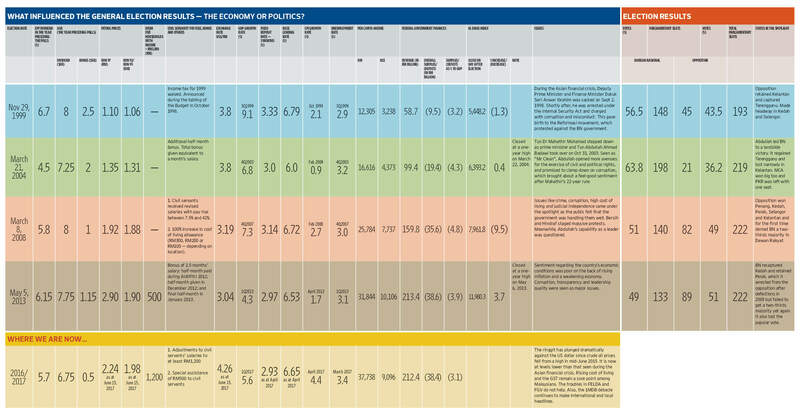 Inflation was low and the country recorded full employment. After 22 years of Datuk Seri (now Tun) Dr Mahathir Mohamad’s rule, the country had a new prime minister in Datuk Seri (now Tun) Abdullah Ahmad Badawi. Abdullah’s new approach, particularly in allowing greater freedom of expression, gave rise to a feel-good factor, and he went on to win by a landslide, with the BN registering its biggest ever victory. But the feel-good factor quickly dissipated as the rising cost of living and an increase in petrol prices caused hardship to the rakyat. At the same time, certain factions within Umno wanted him out. In 2008, BN suffered a major reversal, losing its two-thirds parliamentary majority and five states. Going into the 2013 election, Umno was led by new president and Prime Minister Datuk Seri Najib Razak. 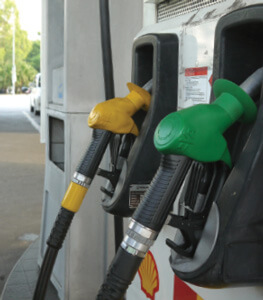 It was the first election after the removal of petrol subsidies and the high cost of living remained a common grouse.BN failed to regain its two-thirds parliamentary majority but won back Kedah and retained Perak. Ahead of GE14, while the opposition is struggling to show a united front, its leaders claim voters are more restless than before. “The ground is fertile for a change. People are angry over many socioeconomic issues,” says Datuk Rais Hussin Mohamed Ariff, strategist for Parti Pribumi Bersatu, the splinter party of Umno. Despite efforts such as BR1M handouts, the rising cost of living, caused in part by the weak ringgit and cut in subsidies, is a sore point. Issues like 1MDB and FELDA add to the issues the BN has to grapple with. Among urban Malaysians, 1MDB is seen as an example of mismanagement and corruption at the highest level. After a rough two years, the economy appears to be picking up pace with a better than expected performanace in 1Q2017 . 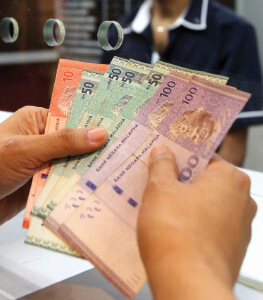 The stock market is showing some buoyancy, while the ringgit has strengthened in recent months. If James Carville is right that elections are won or lost over the economy, the BN should call snap polls soon. Or should it wait till 2018 if it is confident of further improvements in the next 6 to12 months? The risk of waiting is that the economy may slow again. And the opposition will have time to rally around 92-year-old Mahathir, under whose watch Malaysia enjoyed a golden era of economic growth. GE14, whenever it is held, will undoubtedly be the mother of all GEs pitting Najib against Mahathir. It is a classic master vs student showdown, but the student has the power of incumbency and, what appears to be an improving economy, in his favour.